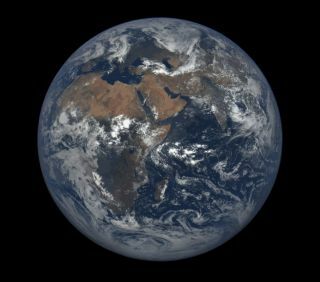 Image of Earth taken by the U.S. National Oceanic and Atmospheric Administration's Deep Space Climate Observatory (DSCOVR) spacecraft. Monday is Feb. 29 — the bissextle or "leap day," an artifact that dates back to the year 46 B.C. Back then, Julius Caesar took the advice of the learned astronomer Sosigenes of Alexandria, who knew from Egyptian experience that the tropical year (also known as the solar year) was about 365.25 days in length. So to account for that residual quarter of a day, an extra day — a leap day — was added to the calendarevery four years. Initially, in order to make a proper transition from the Roman calendar (which had 355 days and which was basically a lunar calendar) to the Julian calendar, and to get the months and various feast days and holidays back into their normal seasons, 90 extra days were inserted into the year 46 B.C. Caesar divided these 90 extra days into three temporary months. One month was added between February and March. Two other months (Intercalaris Prior and Intercalaris Posterior) were added after November. The end result was a year that was 15 months and 445 days long, and was nicknamed Annus Confusionus — the Year of Confusion. Then, to honor his contribution to timekeeping, Julius Caesar later renamed the fifth month (formerly known as Quintilis) after himself (July). See what sweeping changes you can make when you're an emperor? The Julian calendar worked so well at first that many countries adopted it. Unfortunately, it was flawed, being 0.0078 of a day (about 11 minutes and 14 seconds) longer than the tropical year. So, the Julian calendar introduced an error of one day every 128 years, which means that, every 128 years, the tropical year shifts one day backward with respect to the calendar. This made the method for calculating the dates for Easter inaccurate. As a result, by the year 1582 — thanks to the overcompensation of observing too many leap years — the calendar had fallen out of step with the solar year by a total of 10 days. It was then that Pope Gregory XIII stepped in and, with the advice of a German Jesuit mathematician and astronomer named Christopher Clavius, produced our current Gregorian calendar. First, to catch things up, 10 days were omitted after Thursday, Oct. 4, 1582, making the next day Friday, Oct. 15. This edict was most unpopular; many people felt that 10 days had been taken from their lives. There were riots in the streets throughout Europe, and workers demanded their 10 days' pay — forgetting, conveniently, that they hadn't worked those 10 days! Thankfully, the hubbub eventually died down. Next, to more closely match the length of the tropical year, "century years" were declared not to be leap years (though they had been leap years in the old Julian calendar). The exceptions were those century years divisible by 400. And that's why the year 2000 was a leap year, but 1700, 1800 and 1900 were not. The Gregorian calendar, however, was not adopted by the American Colonies until 1752. That's why George Washington was not born on Washington's Birthday. In our time, we celebrate Washington's Birthday on Feb. 22. But the United States' first president was born in 1732 — and by that time, the error in the Julian calendar had increased to 11 days. So a calendar hanging on the wall where Washington was born would have read Feb. 11, 1732. And if you think the 20 years that it took the American Colonies to finally ratify the Gregorian calendar was a long time, that was nothing compared to Russia, which finally accepted calendar reformation in 1918. And Greece held out even longer — all the way to 1923! The Gregorian calendar has proven to be far superior to the Julian calendar. Over a span of one year, it runs 26 seconds too fast, but that's an error so slight that it will not be necessary to eliminate a day from the calendar until around the year 5300. Still, some people would like to see our calendar changed yet again. One of the more popular proposals is the World Calendar created by Elisabeth Achelis of The World Calendar Association in 1930. The World Calendar consists of 364 days. The year would be divided into four quarters, with each quarter consisting of three months. The first month of each new quarter (January, April, July and October) would have 31 days and would always begin on a Sunday. All the remaining months would have just 30 days. In such a setup, each date would fall on the same day of the week every year. So if you were born on a Tuesday, your birthday would always fall on a Tuesday. Independence Day would always fall on a Wednesday; Christmas Day would be a Monday; and Thanksgiving would finally have a fixed date: Nov. 23, since the fourth Thursday in November on the World Calendar would always be on that date. But wait! This is a 364-day calendar. What happens to day 365? And what about leap years? Dec. 31 would be recognized as "Worldsday" (a world holiday). It would come between Saturday, Dec. 30 and Sunday, Jan. 1. As for leap years, the extra day would be inserted not at the end of February as it is now, but at the end of June. June 31 would thus become a second World Holiday; like the Olympics, it would be celebrated every four years. In the Jan. 17, 2016, issue of Parade magazine, Marilyn vos Savant answered a question from a reader who wanted to know if there were a "less clunky" alternative to our present calendar. Vos Savant mentioned the Symmetry454 calendar, a perennial solar calendar that conserves the traditional seven-day week, has symmetrical, equal quarters, and starts every month on Monday. All holidays, birthdays, anniversaries and the like are permanently fixed. All ordinal day and week numbers within the year are also permanently fixed; Friday the 13th never occurs under this calendar. "But there's a teensy drawback," vos Savant wrote. "Every five or six years, you would have to add a week at the end of December!" So it seems that, like it or not, we are stuck — at least for now — with our current calendar.